We’d love your help. 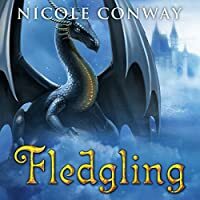 Let us know what’s wrong with this preview of Fledgling by Nicole Conway. Jaevid Broadfeather has grown up as a wartime refugee, hiding from the world because of his mixed racial heritage. He feels his future is hopeless, until a chan When Jaevid Broadfeather is given the rare opportunity to become a dragonrider for the king’s army, the 15-year-old boy has no idea that he is part of a conspiracy that will rock the very foundations of the kingdom. To ask other readers questions about Fledgling, please sign up. This is a charming story of the underdog saving the day! I love those kind of stories and especially those with dragons. It is more for middle grade and teens but I certainly enjoyed the story too. If you love action, adventure, dragons, and suspense then this is for you! I loved the closeness of the dragon and rider bond. Great characters and plot. Well done. I'll read most things with dragons in 'em, YA or otherwise. As advertised, the book has dragons, so +1 star. That's...about it. In terms of the Dragons, Fledgling tries to be a cross between The Dragonriders of Pern and Heart's Blood, but it has neither the charm of the one or the heartfelt intensity of the other. In terms of Sword and Sorcery, it's like a fleshed-out version of a half-assed backstory you come up with for your D&D character to justify "elvish" and "draconic" under the Language I'll read most things with dragons in 'em, YA or otherwise. As advertised, the book has dragons, so +1 star. That's...about it. In terms of Sword and Sorcery, it's like a fleshed-out version of a half-assed backstory you come up with for your D&D character to justify "elvish" and "draconic" under the Languages tab. A bit slow to start, though I think that is due to it being the first book in a series with the need to introduce the characters. The next book will be "Avian", which my Kindle e-book says will be out in Summer 2014. Reading through The Dragonrider Chronicles FaceBook page, this book has apparently been taken down from Amazon.com because... It is being "republished by an official publishing company." Way to go, Nicole Conway! Jaevid is a half-elf, half-human that’s sent to live with this biological human father, Ulric, who makes saddles for dragon riders. Fledgling, especially early on, goes quickly into How to Train Your Dragon territory. Jaevid is basically Elven Hiccup. If this is the How to Train Your Dragon novelization, I’m okay with that (I loved that movie). The story is a little slow. Not in terms of action, but Jaevid’s internal monologue doesn’t quite feel right. The writerly part of my brain started to whi Jaevid is a half-elf, half-human that’s sent to live with this biological human father, Ulric, who makes saddles for dragon riders. Fledgling, especially early on, goes quickly into How to Train Your Dragon territory. Jaevid is basically Elven Hiccup. If this is the How to Train Your Dragon novelization, I’m okay with that (I loved that movie). The story is a little slow. Not in terms of action, but Jaevid’s internal monologue doesn’t quite feel right. The writerly part of my brain started to whisper "passive voice and gerunds...too much passive voice and gerunds..." This pattern of writing makes Jeavid feel like a boring character, even though I’ve got a solid idea of him as a person being that he's a shy fifteen year old. He's a bit more introspective, but there were parts that I started to skim because there was too much passive vs. active voice. Felix is a weird character for me. I like him, but his personality--what we're told and what we see--is a bit incongruous. Felix at once feels too mature and understanding, and yet, he does the silly ‘don’t tell me the clearly important information you have’ shtick. He's also a huge goof-ball when it comes to the other students and girls. As I said, I liked him, but he feels a bit hard to pin down. The dragons don’t have much personality, which is a bit of a shame. (Note: This gets better in Avian, but I want to talk about it in Fledgling, first.) Mavrik feels like an animal here, which is good, but this novel begs for the How to Train Your Dragon comparison. Toothless feels distinct as an animal with a personality, but Mavrik is a bit more of plot prop in this novel. He's an animal, which is good, but he lacks the quirky behaviors normal animals exhibit. Once again, this gets better, but this is where Mavrik's character stands for me in Fledgling. There’s a lot of little, incongruous details in this story that felt silly to me. There are 9 fledglings and yet, a 100 trainees? That’s a very lopsided class size (years 1 and years 2 only were mentioned as being dragon riders). Once again, this is fixed and explained in Avian, but it left me scratching my head in Fledgling. They also jump on the back of a dragon…a dragon that has spines! And live. The slavers didn’t notice their prisoners run free? There was a lot of these little things, which added up for me, and even impacted the enjoyable moments of the book. There are several times in the story where the mentor, Sile, has to be saved by Jae and Felix. It feels a bit repetitive, but it establishes that there’s a faction out for his life and that they're connected to the crown. I liked Sile, but he doesn't explain nearly enough of the major backstory to satisfy me. This is purposeful, but it does obscure his motivations. It took me a little bit to really get a feel for the world and Jae's simple, straightforward thoughts definitely made this a MG book, but I liked that though Jae was special, he wasn't special in all aspects--he has plenty of shortcomings that make him relateable. I want to know a lot more about the gray elves! I'll definitely be reading the rest of the series and whatever else Nicole publishes. "If your really gonna make this deal with me, you have to show me. Show me I can trust you" So starts a relationship between a wild dragon and a halfblood that will have you hooked from the very start of the book. I felt that the book had echoes of the relationship you see between hiccup and toothless in How to train your dragon which for me worked as it a great movie. I love how Sile stands up for Jaevid "Any rider chosen by a dragon must be allowed to join us that is our first law." The wild d "If your really gonna make this deal with me, you have to show me. Show me I can trust you" So starts a relationship between a wild dragon and a halfblood that will have you hooked from the very start of the book. I felt that the book had echoes of the relationship you see between hiccup and toothless in How to train your dragon which for me worked as it a great movie. I love how Sile stands up for Jaevid "Any rider chosen by a dragon must be allowed to join us that is our first law." The wild dragon choose Jaevid so who are these people to say he not a dragonrider just cause he of a mixed heritage that by the end of this book saves a few characters more then once. For by not letting Jaevid in to the academy "You'll be suggesting that the spirit of the dragon no longer matters at all, that we've bred them down to stupid beasts no better then winged pedigree dogs" what a statement of fact about how strongly Sile feels about Jaevid becoming a dragonrider. As Javeid steps in to his place in the academy he learns "We all start at the bottom as fledglings, in this brotherhood, respect must be earned." So Sile has stood up for him and said you should be here but now you must prove it. Their are strong lessons to be found in this story which i feel is great for the middle age crowd such as "You can't just condemn someone, no matter what they've done. Everyone deserves justice, even traitors" Jaevid says this about Tyron a character who truly treats him with no respect, and betrays him more then once in the story. Towards the end of the story one of my favorite scences happens when Jaevid talks to Icarus the dragon of the evil character in the story. He uses his new found knowledge of being able to communicate with animals and he says "I'm going to have a word with the king" its a very powerful scene for Jaevid is basically showing that dragons can thing for themselves and if their master is truly cruel justice will be swift and harsh. **I received this book from the author in exchange of an honest review. Gave this a 4.5 star rating. The way Jaevid grew up was horrible. His upbringing was terrible and no one had respect for me at all. I love that no matter what came his way, being a halfbreed or the drama that took place, he never gave up on anything. He made it a mission to save Sile every time danger arised. For a fledgling he went above and beyond. Ulric is a terrible father. I hated him for treating Jaevid the w **I received this book from the author in exchange of an honest review. Ulric is a terrible father. I hated him for treating Jaevid the way he did. He hated his own son because his mother was an elf. Just unspeakably rude. Sile was an excellent man and father like figure for Jae. He taught him ad nurtured him like a father should. He was the first person to really care about Jae's life and opinions. The way his coworkers treated him for taking Jae under his wing was ruthless. Mavrik was funny! For a wild dragon he definitely allowed Jae to be his rider and train him. That bond between them was strong from the start and only got stronger as their journey went on. Leony was a cowardice punk. I hated him and that's all I have to say about him. Felix was an awesome friend! He didn't care what Jae was, only for the person and kindness he had. Felix was there through it all for Jar. Thick and thin and that is a great foundation for a friendship. Beckah was so sweet and young, but she had some knowledge on her. Loved her character and I think she and Jae would make the cutest couple ever! A Halfling - elf and human - lives with his human father after the death of his elven mother, being despised by both elves and humans, until he bonds with a dragon and is admitted to the academy for training to become a dragonrider in the war between humans and gray elves, which does not make his life any easier. Very short summary here, I don't want to spoil anything, after all. From the simple narrative style and language, I would assume this story is aimed at younger readers, but the plot and A Halfling - elf and human - lives with his human father after the death of his elven mother, being despised by both elves and humans, until he bonds with a dragon and is admitted to the academy for training to become a dragonrider in the war between humans and gray elves, which does not make his life any easier. From the simple narrative style and language, I would assume this story is aimed at younger readers, but the plot and the characters, in my opinion, more than make up for this for an adult reader. Although it cannot compare in my opinion with the Dragonriders of Pern series by Anne McCaffrey, or the Jouster series by Mercedes Lackey, it has everything a reader can wish for: dragons - who doesn't love dragons! - the problems of being an outsider, growing up, learning to take responsibility, and stand up for one's own code of honour. Despite the simplicity of the language, the story is well developped and continues to capture the reader. Summary: There are humans and grey elves in a medieval like world setting and they are enemies. The main character is Jaevid. He is half human, half elf, and despised by both races. One day in his miserable young life, a dragonrider takes interest in him. Shortly after his life changes. I'd call this fantasy-lite. The world building was rather sparse, and there was no back history at all. Nevertheless, it's interesting enough that I will read the sequel. What a delightful book. It was fun and engaging right from the start. I never once felt the urge to skip anything. The action was well paced and the story keeps you engaged. The characters are defined well and the dialogue is sincere. If you like dragons, and scenes with people flying and interacting with dragons you will enjoy this book. Great book for readers young and old. I'm going to add her next book to my to-read list right now. Read this on my Kindle, and the first part definitely needs editing and cleaning up, full of typos and poor grammar. Having said that, it was an enjoyable, if rather lightweight read. I enjoyed this coming of age fantasy adventure with warrior dragons. My rating 4.25. Jaevid was raised by his mother in a war-torn ghetto as a refugee where the guards scorned the gray elves but other refugees scorned Jaevid as a half breed. He never met his human father until his mother died when he was 12. His father reluctantly allows him to sleep in the barn where he is mistreated by his hulking father, hated by his step mother and tormented by his younger half-siblings. His father makes fine I enjoyed this coming of age fantasy adventure with warrior dragons. My rating 4.25. His father makes fine saddles for the dragon riders. A few years after living with his father, he is taken along to work with him as he goes to the Blybrig Academy to deliver the load of saddles to the dragon riders there. Jaevid is a brave young man especially considering he is often bullied for being small and thin. He is fascinated by the dragons and sneaks in to see them. He encounters a wild dragon and is able to convince the dragon that they need each other. His being chosen by the dragon gets him accepted into the academy although the rich students don’t think he belongs and are ready to pummel him. He is lucky to make a friend in a mentoring knight, Lieutenant Sile Derrick, and another young student. Sile works the two boys hard in training suspecting that there is something special about Jaevid. As Jaevid’s training continues it becomes apparent that someone is plotting against Sile. Jaevid and his dragon, Mavrik, are able to step up to save Sile from sabatoge. Months later Jaevid sees Sile kidnapped. Jaevid is unable to convince the other instructors to help so he sets out, with only his dragon, his young friend and a young girl, to attempt a rescue against the king’s guards. Through the dangerous adventure Jaevid and Mavrik build a stronger bond and more secret talents are revealed. I really enjoyed the development of the friendships for Jaevid who had always been alone. I also liked the fast paced action and intrigue. There are clearly political upheavals surrounding the dragon rider knights though the details are not fully revealed in this first book of the series. I enjoyed this and will want to continue the series at some point. I recommend this to middle graders and adults who enjoy dragon adventures. Fledgling is a young adult fantasy novel about a mixed human elf. With the elf and the human nation at war Jaevid does not fit in with anyone except his mother. With her death, at twelve, Jaevid is shipped off to live with his human father. Yet the stars align, and through a series of events Jaevid becomes a Dragonrider. This is the first book in a four book series. It is a lot of character introductions with some good action to keep the reader engaged. 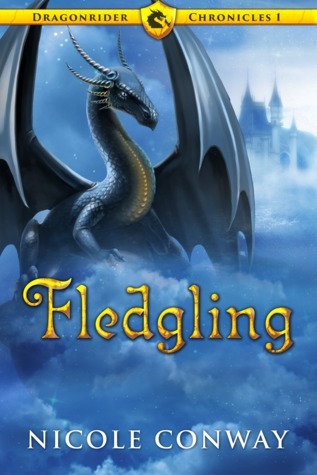 The plot is a pretty classic tale, yet it Fledgling is a young adult fantasy novel about a mixed human elf. With the elf and the human nation at war Jaevid does not fit in with anyone except his mother. With her death, at twelve, Jaevid is shipped off to live with his human father. Yet the stars align, and through a series of events Jaevid becomes a Dragonrider. This is the first book in a four book series. It is a lot of character introductions with some good action to keep the reader engaged. The plot is a pretty classic tale, yet it is done in a way that is engaging and makes you want to keep reading. It would be appropriate for late elementary school and up. As an adult I still enjoyed it immensely. entertaining fast-paced start to a series that is a little short but has an epic feel. From beginning to end this is an easy afternoon read. Seeing as this is a fantasy for adolescents to young adults I have to give it a five star rating for what it is. The fantasy does feel a little short but it also has an epic feel to it. The author does a great job in showing us the tip of the iceberg without going into a great deal of information dumping. It is easy to imagine world as it feels real and vib entertaining fast-paced start to a series that is a little short but has an epic feel. From beginning to end this is an easy afternoon read. Seeing as this is a fantasy for adolescents to young adults I have to give it a five star rating for what it is. The fantasy does feel a little short but it also has an epic feel to it. The author does a great job in showing us the tip of the iceberg without going into a great deal of information dumping. It is easy to imagine world as it feels real and vibrant. I'm not sure how long the series actually is but again it is a perfect little book for adolescence to young adults looking for an easy and entertaining read. There is enough depth to the story to be entertaining to all ages. A good plot, and a nice and cute main character. The story could have been more detailed, now I felt that something was missing quite often. For example, the relationship between Jaevid and his dragon wasn’t described deeply enough. Because there were so good characters, that would have been worth ”more” telling and details. Hyvä tarina, jota olisi voinut kehitellä enemmänkin kohti yksityiskohtia. Jaevidin ja Mavrikin suhdetta olisi voinut rakentaa huomattavan paljon enemmän, mikä olisi saanut ta A good plot, and a nice and cute main character. The story could have been more detailed, now I felt that something was missing quite often. For example, the relationship between Jaevid and his dragon wasn’t described deeply enough. Because there were so good characters, that would have been worth ”more” telling and details. Reader thoughts: I've set down this book several times because the first chapter is dull. It's a summary of Jaevid's life thus far, and there's not much emotion in it. He's a hated halfbreed. His mom dies. He goes to live with his human father, whom he resembles. His step-mother and human siblings hate him. His life is awful. He is undergrown and picked on. He hopes he can be a saddle-maker some day like his father. He has a nice friend, Catty, whose parents feed him and say kind words. It drags. Reader thoughts: I've set down this book several times because the first chapter is dull. It's a summary of Jaevid's life thus far, and there's not much emotion in it. It drags. Yes, stories about down-on-their-luck characters can be interesting (see Harry Potter 's first few years), but this one just wasn't. BEWARE: some minor spoilers ahead. There are quite a few moments of that-is-so-unlikely-that-couldn't-possibly-have-happened. I wouldn't quite call them plot holes, but they were close. 1, the scene where Jaevid meets Mavrik. How would a halfbreed get into the breaking dome? Why would anyone allow him that close to a dragon? And why didn't Jaevid keep his promise that he made to Mavrik (the dragon totally should have burned him to a crisp when he didn't let him go)? 2, Becca's age. She first acts like a maybe nine-year-old (eating dessert first, saying things like, "Daddy says..." and waiting for Jaevid to decide what to do and when to eat). Mostly it's because Sile thought she needed a babysitter . . . for a couple hours. How is she fourteen? Plus, she's smaller than Jaevid, who is reported as scrawny, small, puny, and the like. Wouldn't she be bigger? 3, slavers in the marsh. Jaevid walks around on watch, keeping the sleeping Becca and Darius in sight. Suddenly, Becca screams, and Jaevid runs toward them to find six slavers holding them at swordpoint. Um, how did Jaevid not see them? How did the dragons not see them? Anyway, the slavers then proceed to threaten the people to convince the giant dragons to back off. It works. Two big dragons can't defeat six slavers? Why would six slavers risk coming against dragons just to steal three small kids? What were they doing in the middle of the marsh away from the path anyway? How does anything about this situation make sense?? 4, the way the training was run. Jaevid had to run four miles every morning (torture). He had to memorize maps (and was supposedly really good at it, but he didn't know the way from the one city to the other and had to rely on Darius, who was supposedly bad at map reading). He had to polish gear and learn sword fighting (they learned several moves in just an hour of training, but I'd think they'd still be on stances the first week). Oh, and sometimes they actually trained with their dragons (and the first lesson wasn't about how to get on and off a dragon but a "let's strap you into the saddle and send you up for a spin." This training sounded like it was half-designed to kill the trainees. (Actually, the tests for the second-year students often did kill trainees, which just sounds sloppy to me. Do they really have a plethora of dragon riding students that they can waste so many on testing?) It's like authors want to make up their own fantasy boot camp without knowing quite what sort of training is needed. Um, boot camp is, like, 9 weeks long, not a whole year! Kel and Alanna's knight training was soooo much more practical and specific. Read First Test and Alanna: The First Adventure. 5, Jaevid only seemed heroic at important moments. How do I explain this? The sense I had of his character was that Jaevid was cynical and worldweary. Nobody trusted him, and he didn't trust anybody. He kept his head down, didn't fight back, and hid in the shadows. Then Darius helps him and asks, "You'd do the same for me, wouldn't you?" Uh, no. Everything the reader has seen so far says Jaevid would not put himself at risk for others. He grew up in a dog-eat-halfbreed world. But Jaevid says he would. Really? This happened a couple other times, where Jaevid's character/behavior suddenly changed for a moment to do something heroic just because he had to save the plot. It just wasn't believable to me. 6, the academy people at the end. A few pages ago, they wouldn't listen to his cry of alarm. Now they're bowing to him. Really? Then Jaevid has the nerve to fear he's going to get expelled. I actually hoped he would, because that would not be predictable. No, he's commended for his bravery instead. How typical. BUT, oh, the dragon riding! That was fun. Also, danger and action kept happening. The book didn't slow down, but somehow it was still dull to me (except those couple pages of dragon riding). Writer thoughts: Or call this Marketer's thoughts if you wish. The reason I kept coming back to this book was because Amazon kept recommending books 2 or 3 for me, they looked interesting, and I'd click on them, only to find that they were sequels to Fledgling. Then Audible recommended this book to me. Several books I liked had these as the "also boughts." Finally I caved and decided I had to read (listen to) it. Not bad, but things seemed a bit too coincidental. Everything just happened to work out that he found just what he needed to. The villains were acting so over-the-top cliche I actually laughed aloud during one of the overheard meetings. On the other hand, the main character boy, don't remember his name, but he had an intriguing heritage. He and his dragon were pretty cool at times. Mavrik is pretty great overall. Overall, I'd say the good and bad balance out neatly, to something that was quite r Not bad, but things seemed a bit too coincidental. Everything just happened to work out that he found just what he needed to. The villains were acting so over-the-top cliche I actually laughed aloud during one of the overheard meetings. Amazon recommended this because my son loves dragons and dragon books. I read it also because I just love books. It's a coming-of-age story, and the main character, Jaevid, starts off as a scrawny little halfbreed (human and grey elf) who is scared of everyone. Well, he is still a scrawny little halfbreed at the end but a series of misadventures and finding humans (and a dragon) who actually care about him helps him find courage. I have to say the book starts off a little bit slow, but then as it goes through it picks up. It seems a pretty standard heroes journey. I will certainly be reading any sequels. The dragons are integrated in as if they are not really something huge, but still a big deal to the world. The book is written in a nice casual style, and I enjoyed the actual reading of the book, as much as the story itself. DNF I made it part way into the second chapter before I gave up. There is probably a good story here, I just don't have to the patience to read something so poorly written. On every page I found sentences that I wanted to rewrite. I see other positive reviews for this book and I wish I could enjoy this book as much as others do but I've got a long list of books I know I'll enjoy reading that I can't wait to get to so I'll skip this one. My 9 year old grandson loves fantasy (especially with dragons) novels. I read them first (he has a 12th grade reading level but he’s only 9 - I like to read the books before I purchase/recommend them to him) so we can discuss the books he enjoys. He is going to enjoy this one very much. That ending - CMON NOW!! This book was okay, but it felt lacking. Honestly, I expected more interaction with dragons. In a way this book reminded me of Eragon, except there was definitely more of an established rider + dragon relationship in that series. I'll be reading the second book soon, but I hope it improves because otherwise I might bail on the rest of the series. A good read especially for those of us that that were bullied growing up. I really enjoyed this book as I love reading about Dragons. I was also bullied growing up so I could understand how the hero in this story felt. Well written and am looking forward to the next book in the series. From the depth of a tumultuous childhood to the bonding with a wild Dragon and being trained to become a dragonrider. The development of unknown powers to "call" animals from the ancient times to help during times of slavery, espionage and dark plots against the realm. Can't wait to read the next book in The saga. This was quite good fun. It's not the best YA book I've every read as an adult; but I would have loved this aged 12! I liked the story it sort of reminds me of some of Tamora Pierce's books. I liked the premise of the dragons and the elves and Jae turned out to be a better character then I was expecting. I'll definitely be reading the next book. Nicole Conway is originally from North Alabama and attended Auburn University. She is happily married and enjoys writing as a full time career. Best known for her international bestselling fantasy series, THE DRAGONRIDER CHRONICLES - Nicole is currently working on a follow-on series, THE DRAGONRIDER LEGACY. Her other published works include MAD MAGIC, THE DISTANCE BETWEEN STARS, SCALES (Releasing S Nicole Conway is originally from North Alabama and attended Auburn University. She is happily married and enjoys writing as a full time career. Best known for her international bestselling fantasy series, THE DRAGONRIDER CHRONICLES - Nicole is currently working on a follow-on series, THE DRAGONRIDER LEGACY. Her other published works include MAD MAGIC, THE DISTANCE BETWEEN STARS, SCALES (Releasing Spring 2019), and RENEGADE RUNNER (2021).